Tanya's new venture-Tanya's videos were some of the first I found on YouTube a couple of years back and I still love her channel to this day. She's done so well for herself in recent years too with several beauty launches and now a book! I know you're not supposed to judge a book by its cover but look how gorgeous it is. There's not much information about this book out yet but it'll be out mid-February overseas and possibly here too so keep an eye out for it. You can preorder it now here. Chrome tools from Real Techniques-I would be lost without Sam and Nic's brushes. Seriously, you only need to look at my makeup bag when I'm away to realise that. Well they're bringing out some stunning, innovative new brushes this year-all in a range of metallic hues. 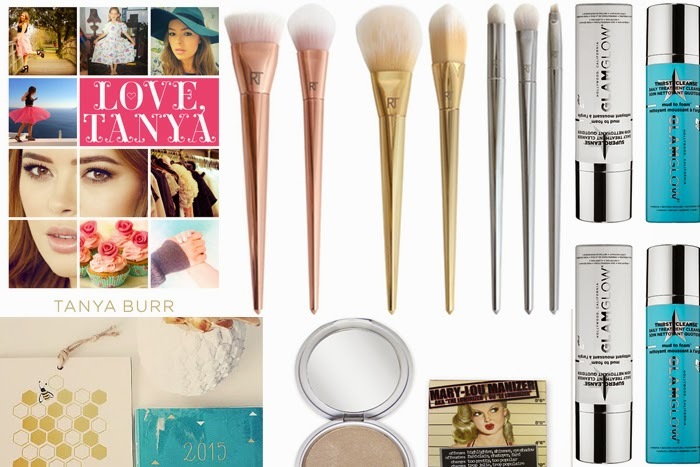 Those rose gold 'finish' brushes have my name on them, but I'm also liking the look of the gold blush brush. They're currently exclusive to Boots and Ulta, you lucky US+UK babes, but here's hoping they become more readily available soon. Nana Wintour in '15-Can you believe NW has been up and running for just over three years now? I can't. 2015 looks set to be another exciting year for the blog but I want to hear from you. What would you like to see on Nana Wintour in 2015? More beauty? More books? Anything else? Let me know! My pen and paper are ready to note down your suggestions. A New Lou-Manizer-Fun fact, I've been highlighter-less for at least a year now. Incandescent Light in my Hourglass palette is good, but as it's designed as more of a finishing powder, it doesn't have the luminous property I've been looking for. A few different highlighters have been ummed and ahhed over several times and I decided to go with theBalm's classic Mary-Lou Manizer when it was on sale recently. #1-It was the cheapest on offer and #2-It's the one I have heard the most about. I'll do a review once it's arrived and had a chance to see if it meets my expectations. GlamGlow's Cleansing Treats-My GlamGlow YouthMud mask ran out last week *sheds a single tear*. I'm still skeptical I'll find something just as good to replace it but in the meantime I can distract myself with this new launch. These two new mud to foam cleansers are a unique addition to the beauty world. They're designed to wipe away makeup and moisturise the skin. I'm very intrigued to say the least. You can grab these now from Sephora but no doubt they'll make their way onto Mecca's shelves in the not too distant future. Summer in Pictures, so far!